Effie M. Morrissey was a schooner skippered by Robert Bartlett that made many scientific expeditions to the Arctic, sponsored by American museums, the Explorers Club and the National Geographic Society. She also helped survey the Arctic for the United States Government during World War II. She is currently designated by the United States Department of the Interior as a National Historic Landmark as part of the New Bedford Whaling National Historical Park. She is the State Ship of Massachusetts. Satterlee General Hospital was the largest Union Army hospital during the American Civil War. Operating from 1862 to 1865 in Philadelphia, Pennsylvania, its physicians and nurses rendered care to thousands of Union soldiers and Confederate prisoners. After its patient population spiked following the battles of Bull Run and Gettysburg, this hospital became the second-largest in the country with 34 wards and hundreds of tents containing 4,500 beds. Cape Columbia is the northernmost point of land of Canada, located on Ellesmere Island in the Qikiqtaaluk Region of Nunavut. It marks the westernmost coastal point of Lincoln Sea in the Arctic Ocean. It is the world's northernmost point of land outside Greenland and the distance to the North Pole is 769 km (478 mi). The Adventures of Captain Hatteras is an adventure novel by Jules Verne in two parts: The English at the North Pole and The desert of ice. Harry Whitney was an American sportsman, adventurer, and author. He traveled to northern Greenland with Robert Peary in 1908, staying over the winter with the Inughuit at Etah and Annoatok. 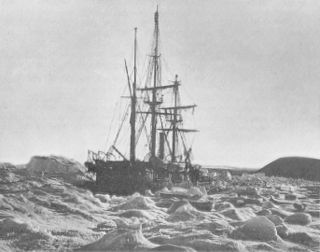 In the spring of 1909 Whitney found himself at the center of the controversy between Frederick Cook and Peary over who had reached the North Pole first. A year after his return, he published a book on the trip. He is sometimes confused with his contemporary Harry Payne Whitney, who was no relation.